If you’re having ignition issues, call Jon’s Locks for repair or replacement. Ignition locks can cost hundreds of dollars for certain car models when a dealership is involved. Repairing or replacing an ignition is not easy. Sometimes it requires disassembling the entire steering column or dashboard. At Jon’s we specialize in repairing ignitions for Hondas and other high security lock cylinders. The ignition is the mechanism that the key goes into and when turned, allows your car to start. Many newer cars even have the added security feature of a transponder chip. However, if your key is not turning, or is sticking, it’s time to let our technician work on the lock and key before it breaks and can’t turn at all. Why Isn’t My Ignition Turning? Sometimes, the car key can get so worn out that it won’t turn and sometimes the tumblers/wafers in the ignition bend and break. Fortunately, at Jon’s Locks, we have rekeying kits for foreign and domestic car models. If your Honda ignition is stuck, call us for a rekey. We can even cut you a new key to factory code specifications. Our customers love special tips to avoid needing to call us during an emergency. 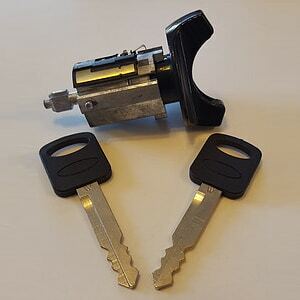 Problem solving is what locksmiths do best so here are a few tips to avoid a broken ignition. Limit keychain knick knacks: A heavy keychain puts unnecessary pressure on the internal workings of your locks. While locks may look robust, they are nothing more than thin wafer and tiny springs. After years of use, the metal wears out and becomes brittle. Extend the life of your locks by limiting the weight of your keychain. Lubricate often: Lubricant is metals best friend. Visit our shop and ask which lubricants we recommend for different locks. Not all locks are built the same, and neither are lubricants. For help with your cars locks, keys, and ignition, call Jon’s Locks today!